The Louvre Museum has 8.5 million visitors per year. This blog was viewed about 260,000 times in 2013. If it were an exhibit at the Louvre Museum, it would take about 11 days for that many people to see it. NOTE: This little summary is something provided (robotly, I suppose) by WordPress. You may count it as your light reading of the day. The room outside the gate where the “letters” were found. Photo by Ferrell Jenkins. Jerusalem was destroyed by the Babylonians in 586 B.C. These letters were written shortly before that time and were in the room at the time of the destruction of Lachish. Take a look at the biblical evidence. The prophet Jeremiah describes a time when only the Judean cities of Lachish and Azekah were left. 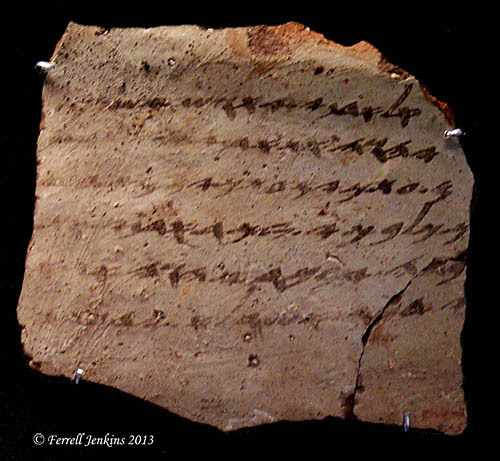 Lachish Letter #4 indicates that only Lachish was left at the time of writing. “And let (my lord) know that we are watching for *[fire] signals of Lachish, according to all the indications which my lord hath given, for we cannot see Azekah” (Pritchard, The Ancient Near East). Letter #3 mentions a prophet. Lachish Ostracon II displayed in the British Museum. The word “Yahweh” [yhwh] is used as the first word (on right) of line 2 in this letter. The prophet Jeremiah may not be the prophet mentioned in Letter #3, but he was a prophet in Judah at the same time, and he wrote about the same situation. Notice Jeremiah 34:6-7 again. This example provides wonderful corroborating evidence for the historical trustworthiness of the writing of Jeremiah. Michael G. Hasel of Southern Adventist University will join Yosef Garfinkel and Martin G. Klingbeil as co-directors of The Lachish Expedition in 2014. Southern has begun a web site devoted to the dig here. Categories include Project Overview, Goals and Strategy, History of Research, and Staff. We wrote about the Lynn H. Wood Archaeological Museum, at Southern, here. The Judean palace-fort at Lachish is the largest Iron Age structure in Israel. Photo by Ferrell Jenkins. Associates for Biblical Research announced here the death of ABR founder Dr. David Livingston. An issue of Bible and Spade devoted to the work of Dr. Livingston has been made available in PDF. Dr. Livingston gave much attention to locating Biblical Ai. I am hopeful Ancient Days, the web site devoted to his writings, will be maintained here. Check ORBIS here. This is the Stanford Geospatial Network Model of the Roman World. Lot’s of possibilities here in studying Paul’s journeys. The BBC reports on how some maps of the modern Middle East were drawn here. Tom Powers has left Jerusalem for North Carolina. Hopefully he will maintain his View From Jerusalem web site. Now would be a good time to check “My Articles” and download his research material on the ancient aqueduct system, Conrad Schick, American Colony, and some ossuaries. My friend Steve Wolfgang is trained as a historian and is a minister with a wide range of interests. This is reflected in his blog, ἐκλεκτικός. I enjoy Larry Hurtado’s Blog. Check “Where did Earliest Christians Meet?” here. If you thought they always met in private homes, you might learn something. One of my favorite blogs, checked regularly, is Charles Savelle’s Bible X, a blog devoted to all things Bible Exposition. Charles surveys material helpful to teachers and ministers. He recently included a link to online tools for creating Infographics, Self-Editing for Better Writing, and lots of brief book reviews. I like to check on Dr. Rod Decker’s NT Resources. Rod has been diagnosed with cancer. One of his colleague’s is dealing with TN — “a nonterminal condition that produces some of the most excruciating pain known to medical science, and that on a very frequent basis.” Recently the two of them spoke in chapel before their students on the general theme “When Your World Crashes Down.” Their comments are available for download. For sure I have mentioned Biblical Studies and technological Tools by Mark Hoffman. This is a great resources. The most recent post evaluates online backup and data syncing options. For a few years now I have been using Dropbox for syncing material between my study computer and my traveling laptop. If you click here you will get 2.25 gig free, and I will get .25 gig addition. Click here. Bible Places Blog. Todd Bolen’s Weekend Roundup, and Midweek Roundup are extremely helpful, as are his insightful comments on recent archaeological announcements. 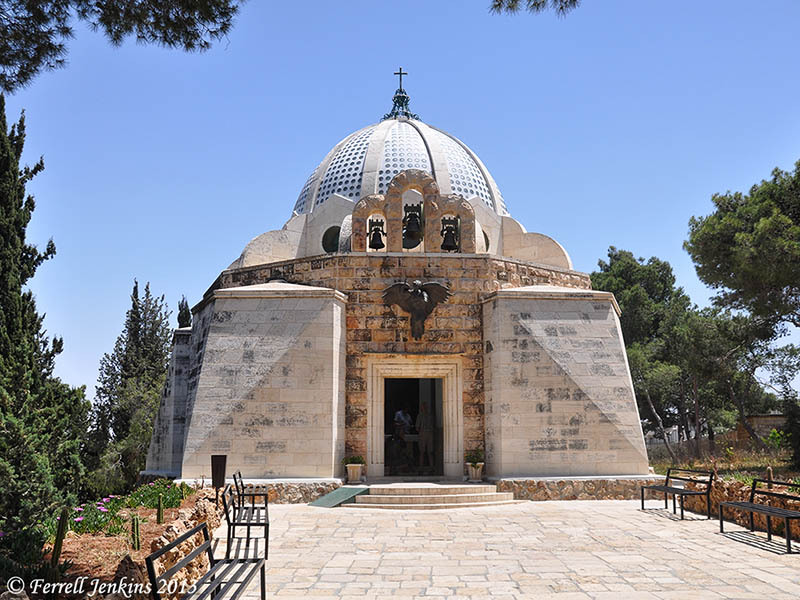 HolyLandPhotos’ Blog by Carl Rasmussen covers numerous lesser known places. Recently he has covered some sites visited, or probably visited, by Paul on his journeys through Asia Minor (modern Turkey). The wilderness of Judea. Photo by Ferrell Jenkins. I have a few former students who write about these areas. You might enjoy taking a look at Leon’s Message Board (Leon Mauldin), Exploring Bible Lands (Barry Britnell), Luke Chandler’s Blog. 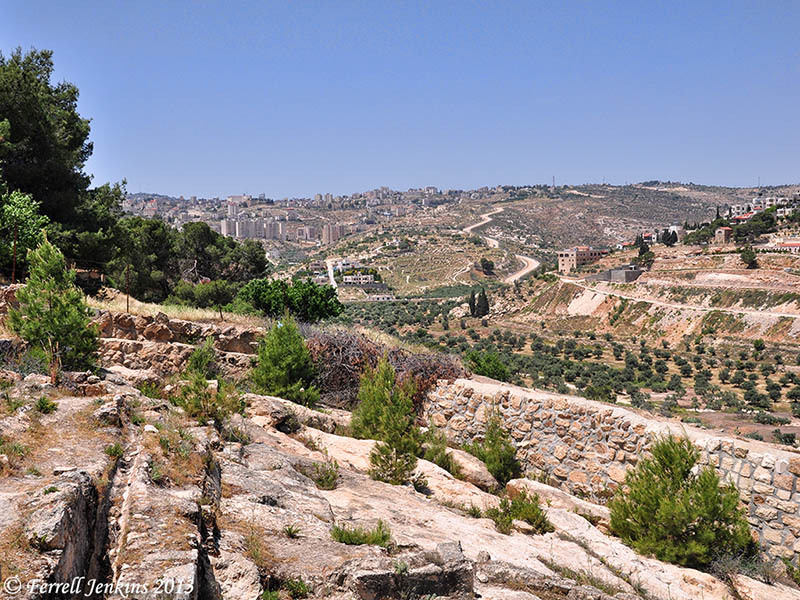 Leon recently posted photos of the gathering of olives at Shechem. Trent and Rebekah, former tour members, have posted some helpful articles during their six months in Israel. Gordon Franz writes less frequently on his Life and Land Seminars, but most of his material reflects a considerable amount of research. As part of his ongoing Cracked Pot Archaeology series he posted a response to the theory that the Arabia of “Mount Sinai in Arabia” (Galatians 4:25) is in modern Saudi Arabia. 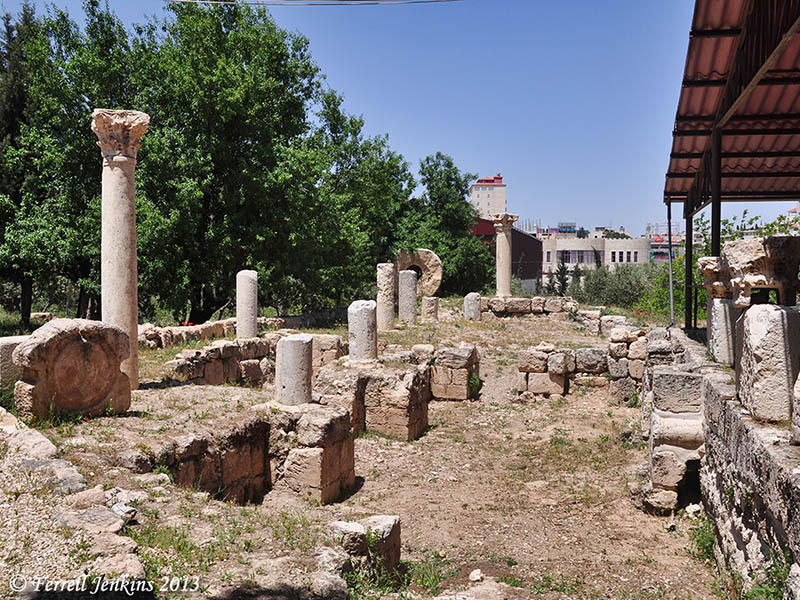 Leen Ritmeyer, Ritmeyer Archaeological Design, writes about the way the buildings looked in Bible times as well as recent discoveries and developments. 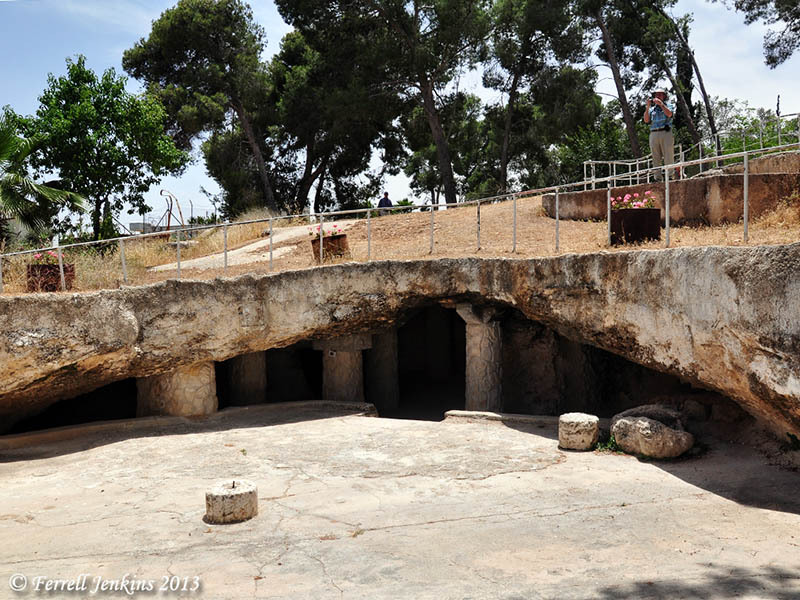 Shmuel Browns, Israel-tourguide, has an interesting blog with great photos. 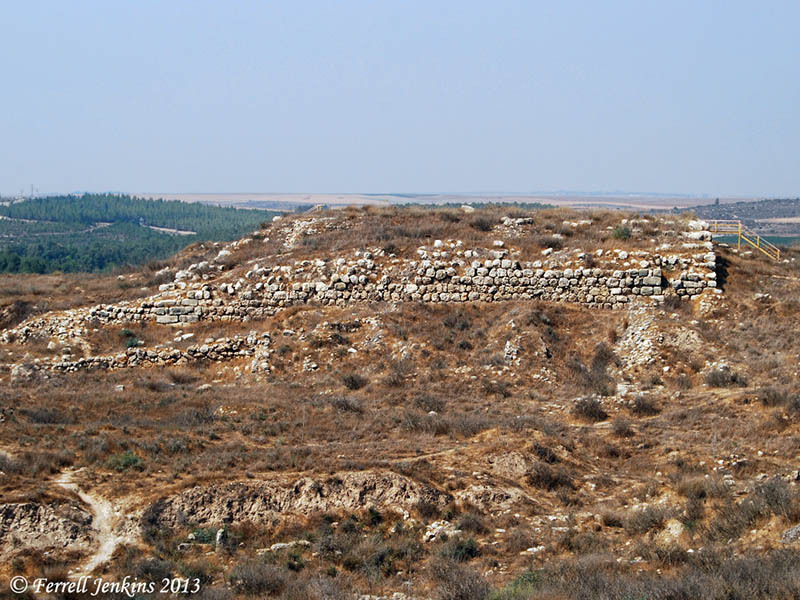 A recent post features fascinating photos of Nahal Prat or Wadi Qelt. 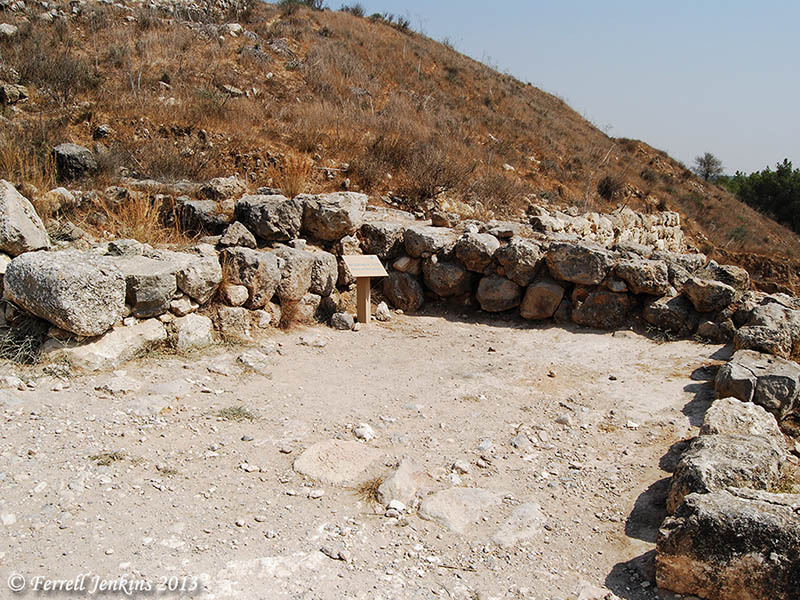 This may be where Jeremiah was told to go and bury his loincloth (shorts) (Jeremiah 13:4-7). Most English versions use the word Euphrates for the Hebrew term Perath. The NET Bible transliterates the term. Nahal Prat is near Jeremiah’s hometown Anatot (Anathoth). We wrote about a morning with Shmuel here. Recently I learned of two new blogs dealing with the Bible lands and customs. Mark Ziese writes Bible Lands Explorer. 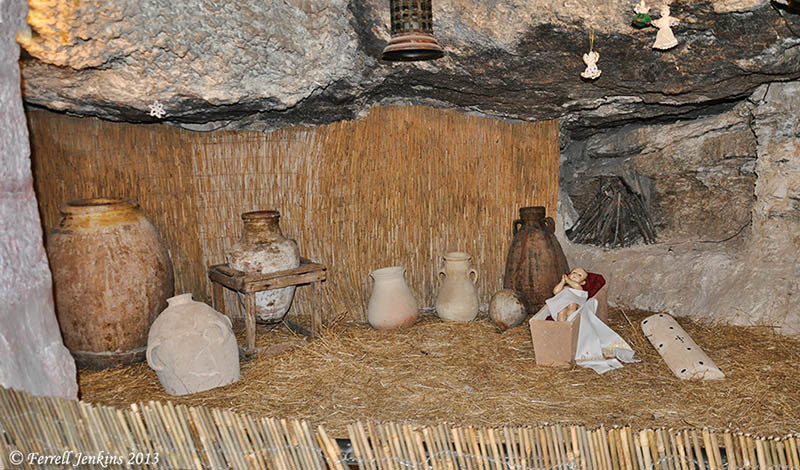 Mark’s most recent post is about the Milk Grotto in Bethlehem. Yep, a place dedicated to Mary feeding baby Jesus. Willis Britt writes on Lessons From The Land. A recent series deals with Preaching and the Land. Believe me, there is quite an education in reading these blogs. I keep links to these and other blogs on the Scholarly page at the Biblical Studies Info Page. Since I started with a small single-volume Smith’s Bible Dictionary more than 60 years ago, I have collected dozens of dictionary volumes on my library shelf and on the computer. My favorite single-volume Bible dictionary has been the Zondervan Illustrated Bible Dictionary (Premier Reference Series) , edited by Merrill C. Tenney. The work has been revised by J. D. Douglas, and is now edited by Moisés Silva. The most recent copyright is 2011. Amazon has this $39.99 volume today (or, at least this hour) for the Kindle priced at $4.99. Dictionaries are more difficult to use on the Kindle than some books, but it is helpful to have some info available when you are away from your home materials. The hardcover volume of Zondervan Illustrated Bible Dictionary (Premier Reference Series) is available for $23.18. Note: Pat, in Kentucky, tells me that this book is available for the Nook also. Several times we have commented on the wonderful photos supplied by Prof. Aren Maeir about the archaeological excavations at Tell es-Safi/Gath, both during the season and throughout the year. 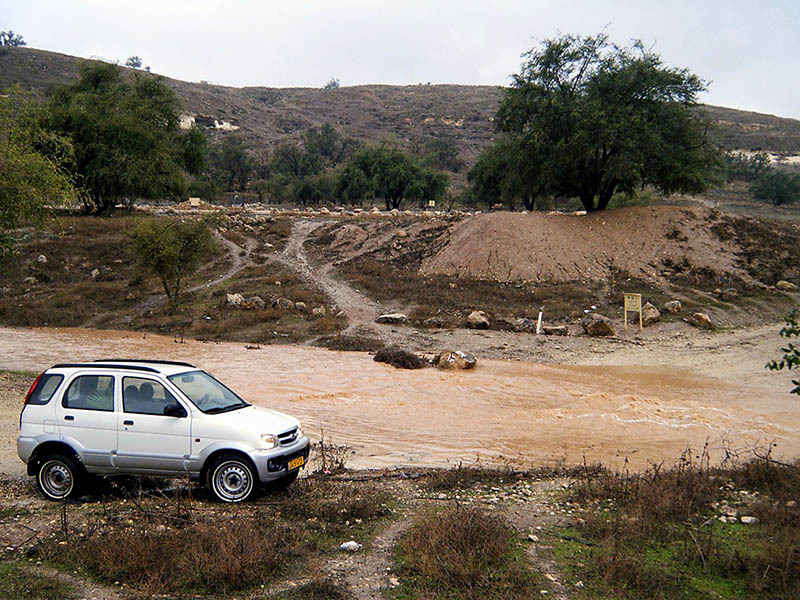 For the past two days Maeir has posted photos of the Elah River flooding at Safi/Gath. English readers will relate to the word brook. The Hebrew is nahal. This is the same brook we read about in the account of David choosing five smooth stones when he went to fight Goliath (1 Samuel 17:40). The term used here is equivalent to the Arabic wadi. A stream like this is dry most of the year, but flows freely during the rainy, winter season. The photo below is from the Tell es-Safi/Gath blog here. It was made by Uri Yehuda, a student in Prof. Maeir’s department at Bar Ilan University. Those who have visited Gath during the dry season should find it instructive. Flooding of the Elah River next to Safi. Photo by Uri Yehuda. You may locate this photo in hi-resolution, and another made by Aren on the blog. The best picture may be in video format with a young lady telling us it is the “flood of December.” The link to all of this material is here. The Brook of Elah begins below Adulam, flows through the valley bearing its name, around Azekah, past Gath, and into the Mediterranean Sea. 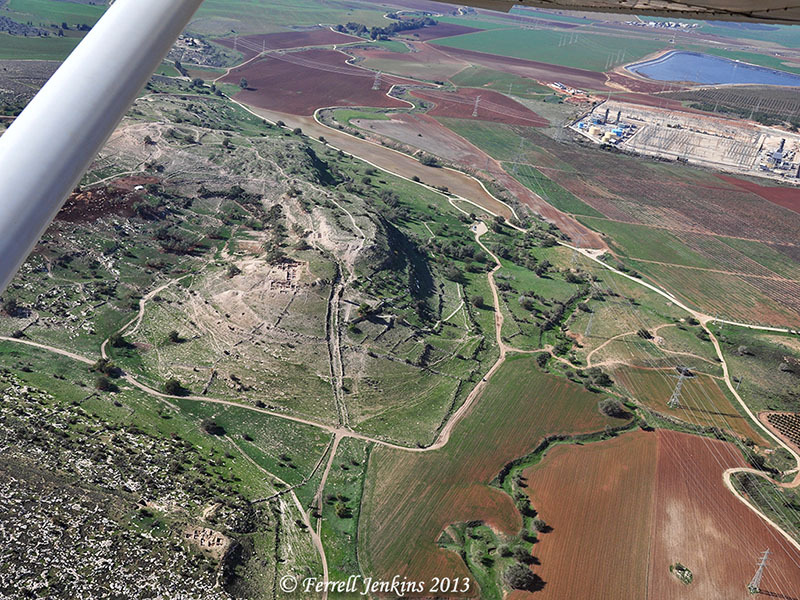 In the aerial photo below you will see Tell es-Safi/Gath just to the left of the center of the photo. The Elah River (Brook) can be seen in the lower right corner of the photo. This photo was made December 15, 2009. 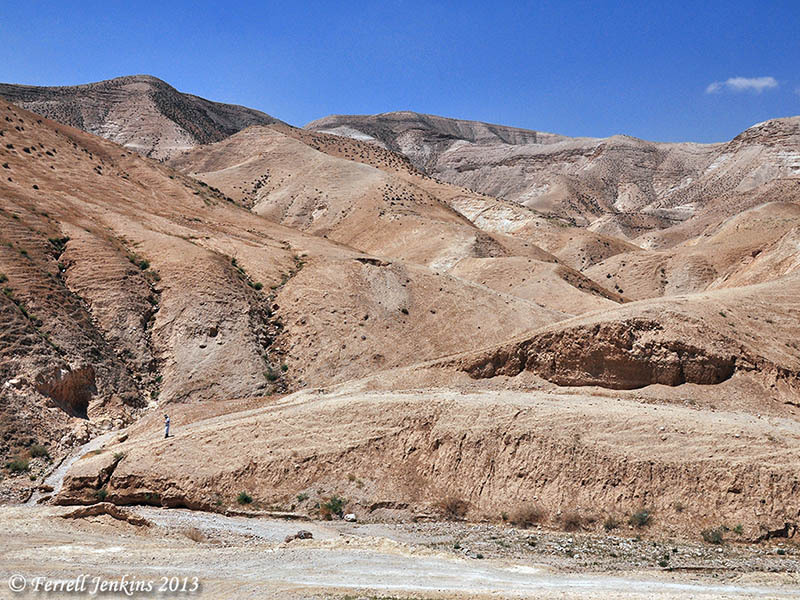 The river bed is green because there had been earlier rains, but nothing like the recent storm seen in Israel. Aerial view of Gath and the Elah Brook. Photo by Ferrell Jenkins.